With a Taste for Life! If Someone Gives You Flowers…Eat Them! We were out on one of our adventures today and we came upon a lovely rustic resort on the shore of the York River. It’s called Silgrey We had the good fortune of meeting the owner Mike as he and a friend dragged a 700 pound piece of burl through the woods. Both men were exhausted from the hard work of physically pulling this large piece of a tree through the forest. But in the end it will be an amazing piece of art. Once Mike caught his breath we had a chance to chat about the resort and marvel at the raw beauty of his setting on the shore of the York River. He is a very interesting transplant from Toronto and he and his wife have created a wilderness retreat that’s just heavenly. As we were about to say our good-byes, Mike asked if we would like to take home some bounty from his garden. As with most gardens, the crops all come in at once and there is waste. But not today! We walked around looking at the selection of vegetables and I spotted some gorgeous zucchini flowers. Mike encouraged me to take some and I wanted to hide my sheer excitement so he wouldn’t think I was some food weirdo. 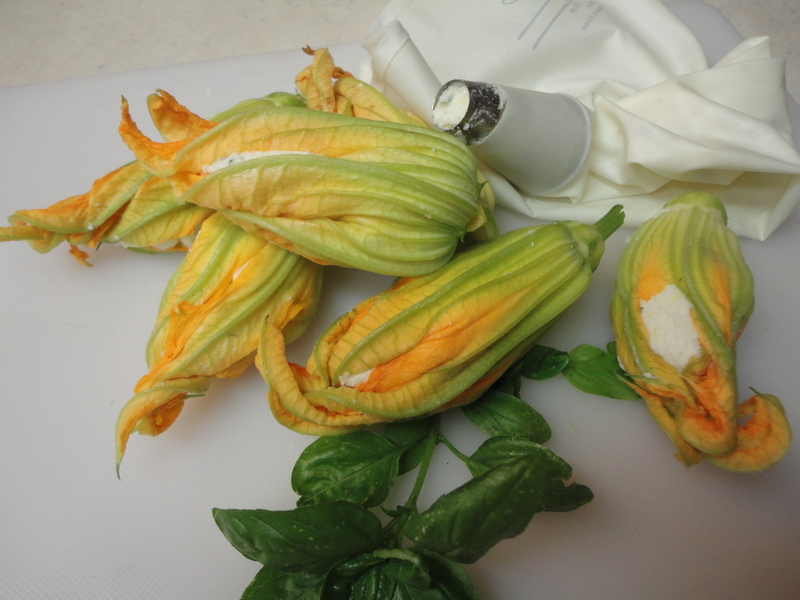 I’m 62 years old and have never had these delicate blossoms stuffed with fragrant ricotta, but today would be my luck day. When we got to the car and started down the driveway to home, I was able to share my pure delight with Harry. How could he know that as a foodie, weird or otherwise, this was like a dream come true. 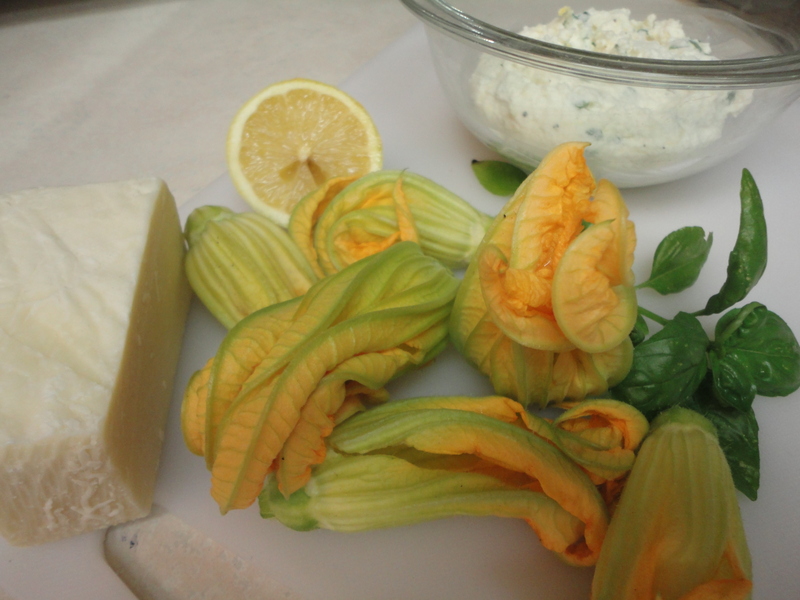 A gift of fresh off-the-vine zucchini blossoms would be transformed into dinner tonight! Here is the Two Food Nuts Recipe. Mix everything together in a small bowl and fill a piping bag with the cheese mixture. Remove the stamen from the center of each flower and stuff them by putting the piping nozzle fully into the flower and squeezing the filling to fill the blossom. Then twist the tips of the petals to form a little flower pouch. Canola or Peanut oil for frying. Place everything into a bowl except the sparkling water. With a whisk, quickly stir in the water and mix just until incorporated. Do Not Over Mix or the batter will be heavy. This batter must be used within half an hour. So make it after you have filled the flowers and you have the oil heating. Dip the filled blossoms into the batter, allow the excess to drip off and deep fry at 400F for 4-5 minutes or until the batter becomes just golden. Take extreme care when deep frying. We take the deep fryer outside and place it on a sturdy table that we have lined with newspaper. This avoids oily smells and clean up is a matter of folding up the newspapers. If using a dutch oven only fill to 1/3 full never leave unattended. Use a thermometer to be sure not to overheat the oil. 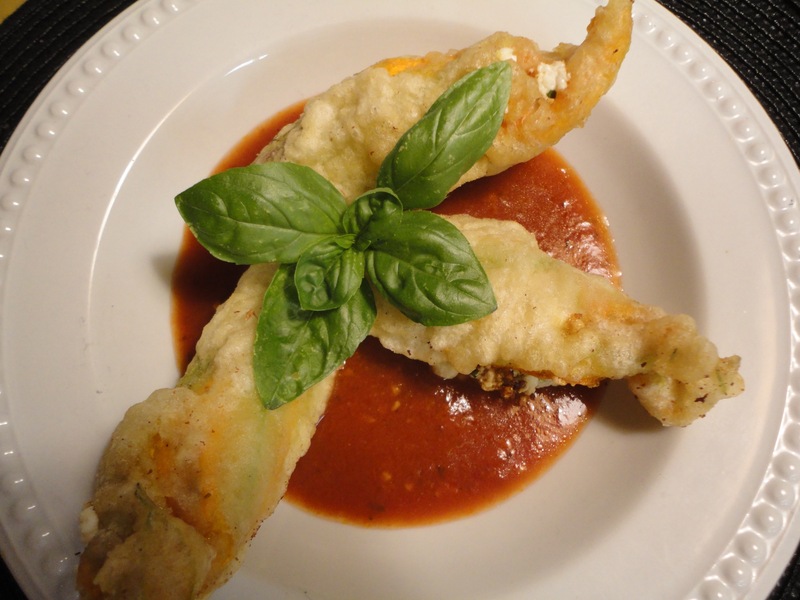 Serve on a light marinara sauce or your favorite spaghetti sauce. 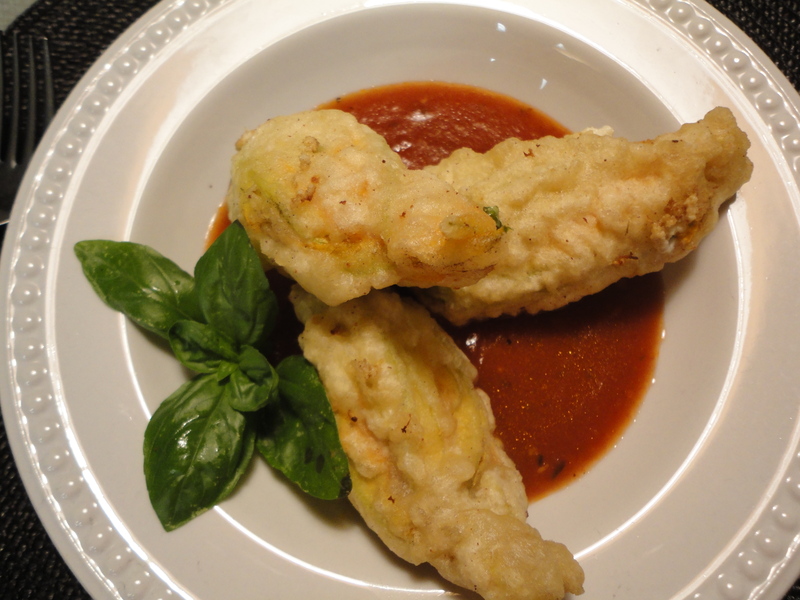 Zucchini Flowers are as rare as hen’s teeth so if you have the good fortune to receive them as a gift, make sure you eat them! These Two Food Nuts certainly did! twofoodnuts on A Really Crummy Recipe.